A huge percentage of those who bought the shoe testified to its virtually no breaking in period. It was very comfortable, according to numerous wearers. Scores of owners mentioned that it runs true to size. The Ariat Terrain Waterproof offered great ankle support, based on plenty of user reviews. A handful of outdoor lovers lauded its versatility. The lightness of the Terrain Waterproof from Ariat received approval from the majority. 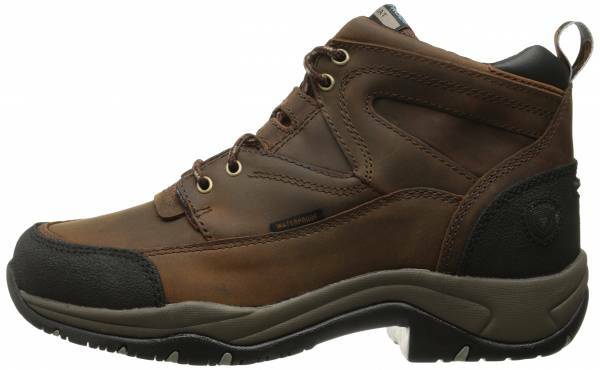 Most online purchasers testified to the efficient waterproofing of this day hiking boot. An expert reviewer and a couple of hikers loved the accommodating fit of the Terrain Waterproof. A considerable number of users were crestfallen when the outsole and the toe guard separated from the rest of the boot too soon. A few noted that the Terrain Waterproof should have more aggressive lugs to be suitable for hiking. Ariat designed the Terrain Waterproof to stand up to most types of outdoor conditions. Its comfort, lightness and sufficient ankle support were testaments to its well-deserved applause. Add to that is its efficient waterproofing and commendable fit and sizing. However, concerns were raised when owners experienced durability issues. Taking everything into account, the Ariat Terrain Waterproof seems to be a good choice of a mid-cut day hiking boot for tamed trails. Using it on harsh, rugged terrain might render it damaged. So this boot would be really good for everyday work in the barn as well as trail riders. You can do your work in the barn and then get on your horse with the same boot. They are a great shoe. And if you are looking for something like general riding or just something to do around the barn, they keep your feet warm. I think they'd be someting to definitely consider. From hiking to endurance riding, the Ariat Terrain Waterproof is made ready for a range of outdoor activities. A Duratread outsole grants traction on trails. The upper is powered by the Waterproof Pro feature. It is a technology that combines water-hating leather and lining for optimal protection. Rubber reinforcements on the heel and toe, heel pull loop and cushioned cuff are the additional features of the boot. It is equipped with the Advanced Torque Stability (ATS). It delivers a cushy and comfy stride while promoting proper gait. This feature also helps in fatigue reduction even after miles of walking. The Ariat Terrain Waterproof caters to men and women. It comes in standard and wide widths, as well as regular sizes. It has a round toe shape which grants enough wiggle room. The boot is relatively true to size. The Ariat Terrain Waterproof has the Duratread rubber outsole. It is made of a compound that renders grip and flexibility. It is also resistant to wear, acids, oil and slips. An EVA midsole partnered with Ariat-exclusive technology, the Advanced Torque Stability (ATS), grants a supportive and comfortable ride. A moisture-wicking top layer renders a cool and dry in-shoe feel. Gel-cushioned pods are attached to the heel and forefoot to enhance comfort and give rebound. Additionally, to promote stability, Ariat designers also incorporated a composite forked shank which is ergonomic and lightweight. As part of Ariat’s Waterproof Pro technology, this day hiking boot uses full-grain leather and a membrane that is both waterproof and breathable. A lining that wicks away moisture helps to maintain the freshness of the foot. The heel and toe areas are reinforced for durability and protection. Its collar is padded for comfort while a logo-embroidered pull tab at the back assists in donning and doffing. This product comes in a non-waterproof version named Ariat Terrain.